Dr Ananda offers insights into understanding contentment from a yogic point of view. Unexcelled ease and bliss awaits those who manifest the virtue of contentment. Santosha is contentment. When one achieves that “state” of contented oneness, unexcelled ease and bliss is the reward. Un‑ease and non‑bliss are the result of dichotomy, division, duality. Oneness is contentment. If we are able to be content with whatever we have – physically, emotionally, mentally, spiritually – we will be at ease (sukha) with ourselves, wherever we are. This is not the contentment of a tamasica nature. Tamasica contentment is for those who do not do anything (or those clever enough to have someone else do it for them). The rajasica contentment is the quality of those who seek recognition. The sattwica contentment is of those who act without showing that they are doing. From the outside the sattwica sadhaka looks as though they are not doing anything at all. The extremes seem to the external, superficial view to be the same. Both the tamasica and the sattwica approach towards santosham may look the same (as they are not seen doing anything) but the sattwica are acting without seeming to act and thereby attain santosha. Contentment is not complacency or stagnation. Those stuck in a comfortable rut are not experiencing santosham. They are simply sleep‑walking through life. True santosham is vitally awake and alert. Unexcelled joy comes when one is at peace with oneself and totally at ease. When we are content with whatever we get, we get everything we need. Dichotomy and duality disappear in contentment as one becomes the Universe. If we are united at the universal level, at one with the cosmos, then everything and everyone in the cosmos is “us” and we possess all. What is there to gain? What is there to lose in such a state? Hence, supreme contentment ensues. When the Divine knows that we are not after anything, it will give us everything. Why do people want a degree, a job, a wife, children, a house, a car? Because they believe such things will bring happiness. But, they make a drastic mistake. These desires only feed discontent and fear. Discontent comes because the object does not bring the happiness we sought! Fear comes because we are afraid we may lose what we have gained. The moment we realize that we can have happiness with whatever we get, we get all. Interestingly in the Dravidian Tamil language, santosham also means happiness. Discontent is a synonym for unhappiness. As my beloved Swamiji said, “You do not have a problem, you are the problem!” When we help ourself by ourself, we no longer have problems and experience contentment. Discontent is being cultivated by modern advertising media and the business interests. This is also true in the world of yoga. Instead of saying “Yoga will solve all your problems” one should say “Yoga can help you cope better with your condition”. This is more correct. Otherwise, one only feeds more and more discontent. In the world of yoga today the market is for gadgets: mats, straps, bricks, belts and trendy toys. What nonsense! If you do not have the right gadgets you cannot practice yoga! Isn’t that the most absurd thing you have ever heard? Contentment is being able to say with honest feeling, “I know I have got enough”. Santosham is the inner attitude of being content with who we are, where we are and with every life situation we face. This is the key to tuning into anandamaya kosha, the universal blissful existence. Think about the concept of nishkama, as espoused by Lord Krishna in the Bhagavad Gita: do not be attached to the fruits of the action but only concentrate on making the best effort. Let go of the results. Why do we do things? If it is in anticipation and expectation of the result, we will never be content. The curse of discontentment will follow us like a dark shadow until we wake up to the reality of love and life. The truth is that: everything we need will be given to us when we are ready for it. When we live in contentment, we will be able to fulfill our dharma, as we will be able to live as ourselves. Do things out of love. Do them out of profound and deep spiritual interest. Do not be motivated by limited and mundane material interest. One’s life will then be blessed every moment by santosha. 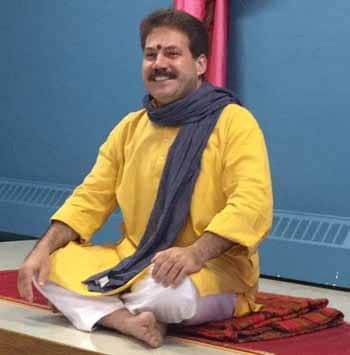 Yogacharya Dr. Ananda Balayogi Bhavanani is presenting at the SOYA Annual Retreat June 1-3, 2018 at Sorrento BC. He is a Certified Yoga Therapist with IAYT, the Director of CYTER, and the Chairman of ICYER at Ananda Ashram in Pondicherry, India.